I love holidays because it gives me an excuse to get creative and come up with fun treats for my kids to share with their classmates and friends. For Halloween this year, I wanted to do something special for my daughter’s preschool class. 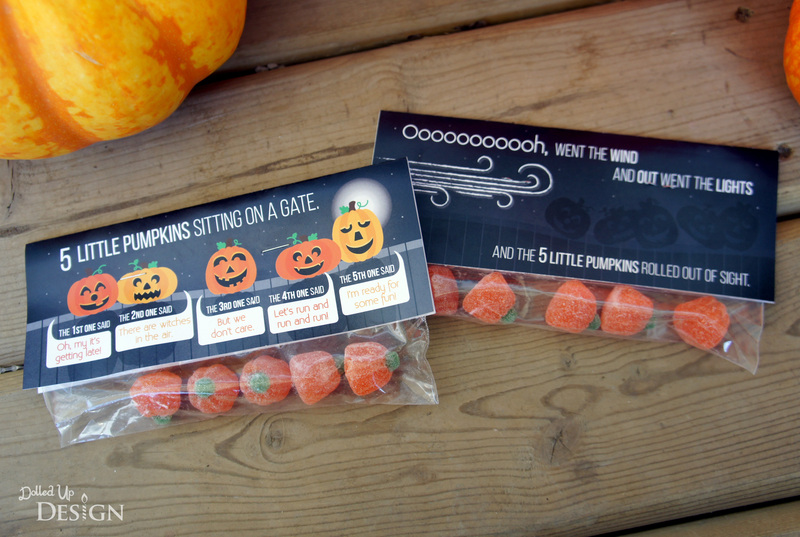 I came across this Five Little Pumpkins Sitting On a Gate Halloween Printable from Balancing Home and loved the idea so much I decided to take a shot at designing my own topper featuring the 5 Little Pumpkins poem. I the clean, modern version from Balancing Home, but I wanted something a little more cartoonish for the preschool kids. I also wanted to take advantage of both sides of the treat topper to help illustrate the poem. 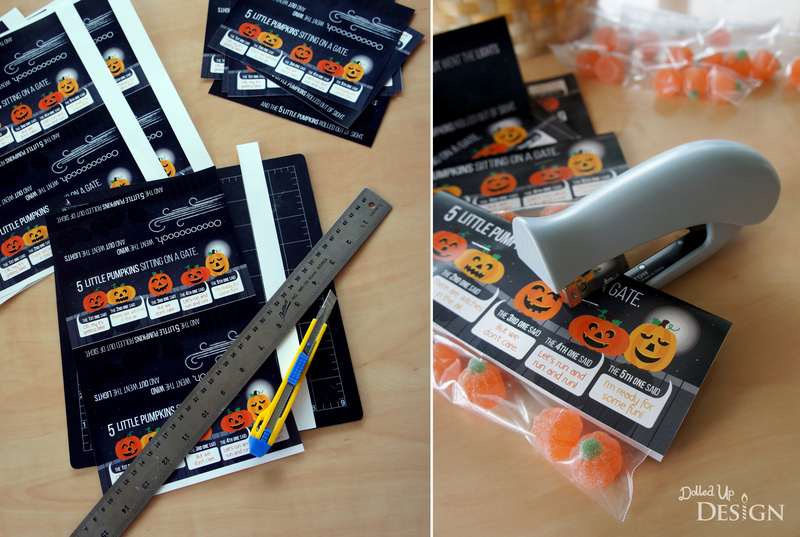 Print out my 5 Little Pumpkin Treat Toppers file (linked above) using a color printer. Cut out each of the paper toppers using scissors or an Exacto knife. 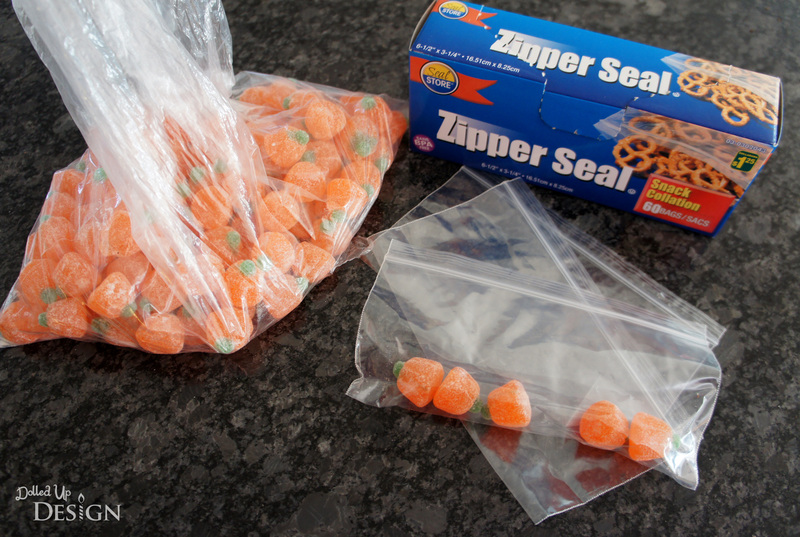 Put 5 of the pumpkin shaped candies in each of your zipper seal bags and seal closed. Fold a paper topper in half over the Ziploc bag and staple into place with 2 staples. 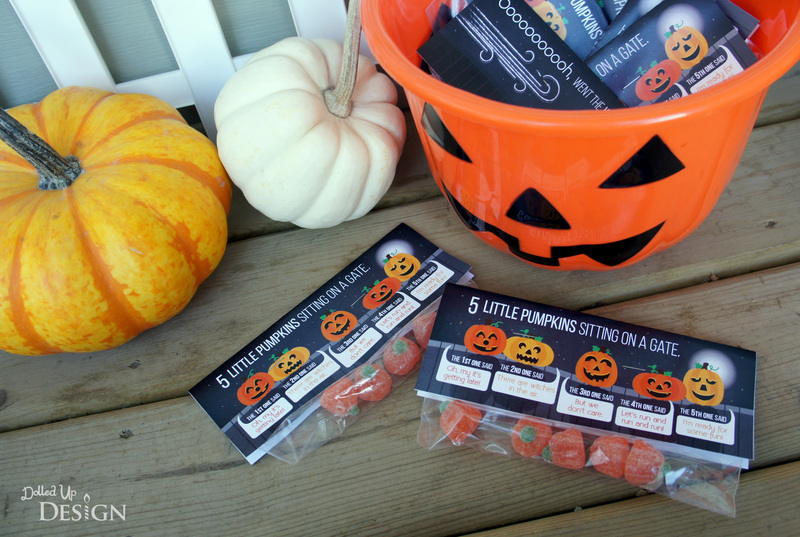 It is amazing what a little bit of packaging can do to transform the simplest of treats. I used jelly pumpkins, but mallowcreme or foil wrapped chocolate pumpkins also work very well. I don’t get a chance to do as much graphic design as much as I’d like, so I had a lot of fun illustrating these toppers. I know the kids will enjoy the candies, and I hope the parents enjoy sharing and reading out this fun little Halloween poem to their kids. *I have had a request for a second version of the printable that has the “There are witches in the air” line changed to “There’s a chill in the air”. 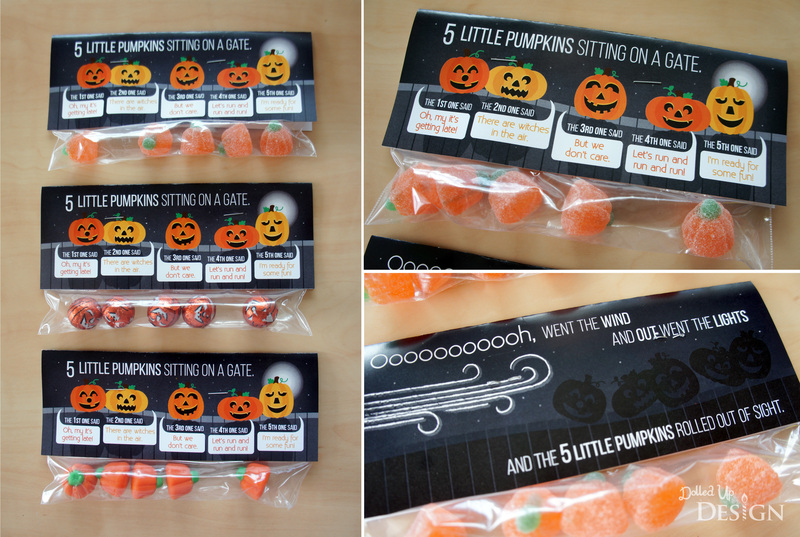 Please find that 5 Little Pumpkins Treat Topper v2 printable file here. Wow, you did such a great job with the design! I have a question. I want to make these for my class, but we aren’t allowed to use anything with witches, so I wanted to cover up that part with “There’s a chill in the air.” Can I do that? Also, what font did you use for it? Thank you so much! I will work to make those changes and get a second uploaded for you Monday morning. Yes! Would love a version without “witch” in it too 🙂 Thank you! New version is uploaded on the bottom of the post! Hi!!! I LOVE THIS! Thank you so much. I am wondering if you could make one for me that switches the 4th and 5th lines? I have taught it to my preschool class with 4th saying ready for some fun and 5th saying run and run and run. I will be sharing your blog with all of my teacher friends. LOVE! Hi Andrea, If you can email me at cmames@hotmail.com I will email that version back to you.